Preserved beneath the blanket bog of northern county Mayo are the remains of a fully preserve prehistoric landscape composed of field walls, enclosures, houses and megalithic tombs dating from the Neolithic or New Stone Age. This is one of the largest archaeological sites in the world and tells a story of the everyday lives of a farming people, their organised society, their highly developed spiritual beliefs, and their struggle against a changing environment beyond their control. 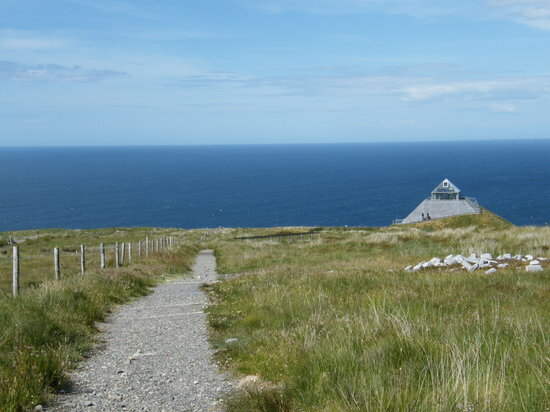 The Céide Fields Visitor Centre was established by the Office of Public Works to assist with the visit to this unique area. The centre has exhibitions, an audio-visual show and tearooms and provides guided tour with professional guides. Guided walking tours of the site lasting between 45 - 60 minutes. As the tour is outdoors on uneven and sometimes wet terrain visitors are advised to wear weather protective clothing and appropriate footwear Tearoom providing home made cakes, scones, soup, sandwiches etc. The centre is open from Easter until November 6th. It is also available for bookings throughout the winter.